The Canadian Dressage Team earned the silver medal for the second consecutive year in the CDIO 3* FEI Nations Cup presented by Stillpoint Farm, held March 13-14, 2019, during the Adequan Global Dressage Festival (AGDF) 10 in Wellington, FL. The annual Nations Cup provides Canadian dressage athletes with the rare opportunity to compete as a team. As per the AGDF Nations Cup rules, teams consist of three or four riders, and can contain a mix of big and small tour horse-rider combinations, with a bonus of 1.5% added to big tour scores. The Canadian Dressage Team was represented by Jill Irving of Moncton, NB, Tina Irwin of Stouffville, ON, Lindsay Kellock, who currently resides in Wellington, FL, and Belinda Trussell of Stouffville, ON. Leading the team to the podium was Irwin and her long-time partner, Laurencio (Laurentio x Donnerhall), a 12-year-old Oldenburg gelding she owns with her husband and fellow Grand Prix athlete, Jaimey Irwin. No strangers to small tour success, having achieved a world record score in 2017, the duo contributed back-to-back wins to Canada’s score in the Nations Cup. They started strong after earning a personal best score of 74.912% on day one in the CDIO 3* Prix St. Georges, then followed up with 73.588% in the Intermediate I during an evening performance under the lights on March 14. 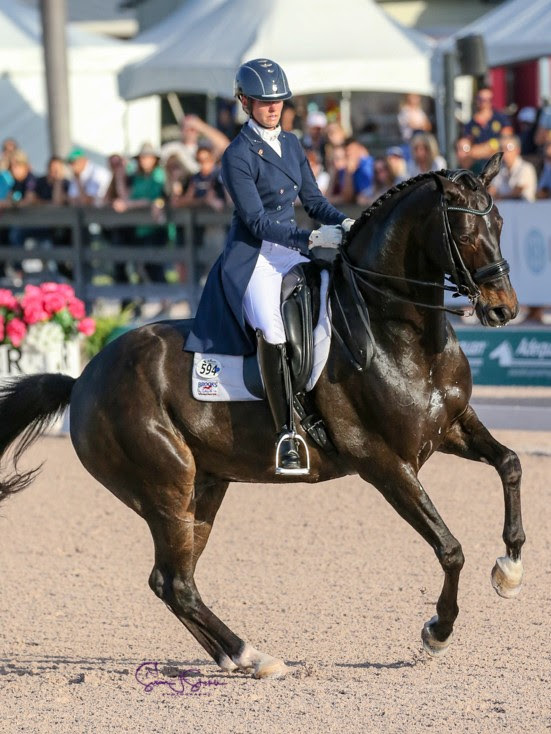 Tina Irwin of Stouffville, ON led the Canadian Dressage Team to a silver medal in the CDIO 3* FEI Nations Cup aboard Laurencio on March 14 in Wellington, FL. The accomplishment was made even more impressive considering Irwin had recently taken a break from competition since AGDF 5 due to injury, passing the reins to Jaimey in the interim. Kellock wasn’t far behind Irwin on the small tour leaderboard, which made for an exciting nations cup debut for the 28-year-old rising star. Paired with Floratina (Fidertanz x Rubin-Royal), Chloe Gasiorowski’s 11-year-old Hanoverian mare, she kicked things off with a score of 71.824% for third place in the CDIO 3* Prix St. Georges, then moved up to second in the Prix St. Georges on 71.500%. 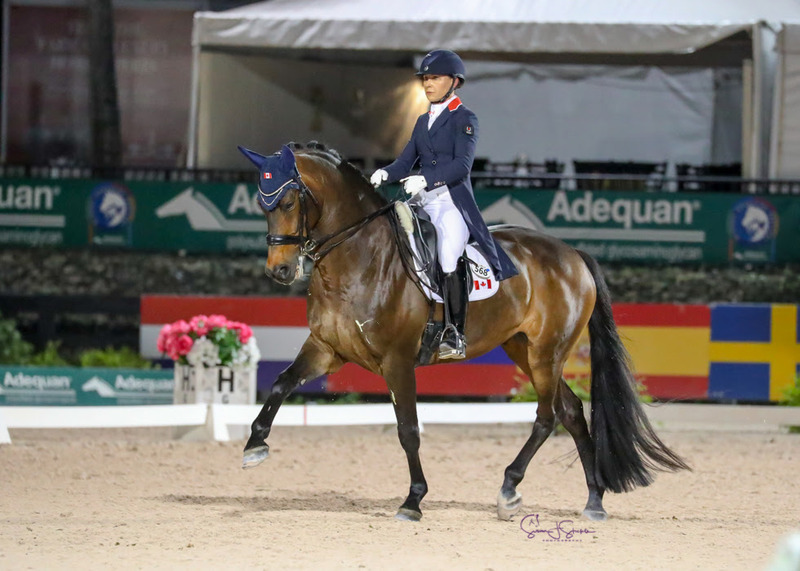 Irving, who made her major games debut at the 2018 FEI World Equestrian Games, was Canada’s sole representative in the big tour with Arthur (Jazz x Contango), Windhaven Farm’s 14-year-old Dutch Warmblood gelding. Their strong performances resulted in third place finishes in both the CDIO 3* Grand Prix on March 13 and Grand Prix Special on March 14. With the big tour bonus added, they enjoyed scores of 68.457% on day one, and 70.404% for their Grand Prix Special. Canadian veteran, Trussell rounded out the team, competing in the small tour with her up-and-coming partner, Carlucci (Contendro I x Compliment), a 14-year-old Hanoverian gelding owned by Barbara Holden Sinclair. Their scores of 68.176% in the Prix St. Georges and 68.176% in the Intermediate I earned them fifth and sixth place, respectively. At the close of the two-day competition, Canada earned their silver medal on a combined team score of 433.685 – not far off the United States, who took gold with 437.693. Bronze went to Germany on 402.724, while Colombia finished just off the podium in fourth (389.647). With the team medals now decided, athletes will move forward to challenge the freestyles for individual honours on March 15. For more information on the Nations Cup, and full results, visit http://gdf.coth.com .